A boat has no brakes. Travelling the open waters, it has to rely on the motor or the sails to keep moving in a desired direction. If a boat loses its mobility, it is at the mercy of the sea, the waves and the wind. Having no brakes implies that obstacles have to be detected long in advance and a change of course must be planned and followed. To change its path a rudder is used, and again, the wind and the waves together with the sails have to cooperate. After a day of rough sailing, nothing rejoices the heart more than the sighting of a sheltered cove or a calm bay. The boat slows down and approaches that place of safety; now is the time to anchor. Even after smoother sailing, the prospects of rest while watching the sunset, a quiet meal and a conversation with shipmates are enticing. Some sea farers prefer a port or a marina, but these choices imply a clear break from Poseidon and his many blessings. The tied boat loses its freedom and individual character and becomes a hostage to the gods of the land. A securely attached boat moves gently, in big circles around the anchor. The changing breeze and currents seem to enjoy dancing with the boat and the anchor, which is rooted in the ground below the water, providing a balance to the forces of nature. The chain or rope connecting the boat to the anchor must be three to four times longer than the depth of the anchorage. 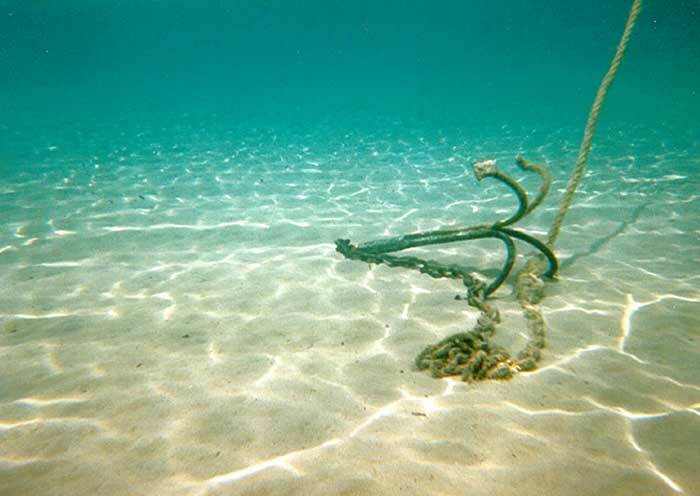 If the length is shorter, the anchor tends to slip out instead of digging deeper into the earth. If it is longer, the boat can move too far from the center and might hit the rocks or a nearby vessel or get grounded on a sand bank. The scenery changes with the predictable turns around the anchor. As the hours of the day complete their cycle there are varying color palettes and different intensities of light. Changing horizons continue to appear and recede beyond visibility; and at night, different star constellations and distant moving lights of islands, shores or other boats join the party. The circular movement continues while the boat remains at the same place. Any conversation about profound truths has to be anchored; externally, by context, goals, and agreements between the participants who might be more or less aware of their implicit contract; internally shared state of consciousness that allows for meeting of minds and hearts. Shared vocabulary, stories and images make the chain which holds these together. And as in that myth, a profound question does not need a follow up; just asking it moves the conversation to a higher level or to deeper spaces. How do you anchor? How long is the chain you allow yourself? How deep are your waters? Is the bottom made of mud, sand or rocks? At what frequency do you rotate around your anchor? How far are the neighboring boats? When you come closer to another vessel, is there someone holding a fender to soften the encounter? To make sure the anchor is secure and not dragging; one can observe the direction at which fixed objects appear on the horizon. One needs to choose two or three such things; a light house, a building, a tree, and keep checking against them with the compass. The stars at night can be misleading as they slowly move. What is there in your horizon that helps you orient and feel safe? Some people hang on tightly to these pointers and disallow their boat to circulate. Sooner or later their chains entangle or their anchor pulls out and it might not be noticeable until danger is at hand. An anchor often resembles a plough. It has a sharp point that digs into the ground or hooks to the rocks. Mooring safely requires that sharp edge to point downwards, toward the center of the earth. Looking up at the stars, one can find another plough, sometime called the dipper, while in India the constellation is called “The seven great sages”. When crossing the ocean there are often miles of water underneath; no one can anchor there. One needs to trust the vessel to keep afloat, continue moving and endure nature’s trials and tribulations. When sitting with a client, the therapist has to be anchored. Some use breathing, others use deep concentration or meditation; others trust their gracious heart or the depth of their faith in the rightness and meaningfulness of this moment of encounter. Yet others rely more on their body wisdom, or on especially cultivated sensitivities or intuitions. A brief ritual before a session helps some find their center. A beautiful object in the room or a water fountain can remind one of the essential reasons for doing this work. How do you reconnect with your core? How do you remember safety, so it can be generously shared with another human being who might be feeling not so safe in this very moment? Sometimes the wind is unstable. The boat moves up and down and turns erratically around the anchor. The billows bang against the hull and the ropes screech as they stretch and let go again and again with each wave. At such times it is best to keep a watch. The sailors take turns sitting outside under the stars or the clouds and relentlessly check their position compared to stationary land marks, making sure the boat is not drifting onto the rocks. If things become unsafe or unstable, they will pull out the anchor and sail away. But even after a peaceful mooring the time to pull anchor and sail away always comes. However welcome the hospitality that surrounds us, we are permitted to receive it but a little while. To make sure the anchor comes out of the ground, its sharp edge must point upwards towards the sky, and the boat must be right above it. Otherwise it digs deeper into the mud or its rope gets entangled. A good sailor has learned to perform all these complex calculations intuitively and at ease. Breathing deeply and exhaling each time the anchor chain is pulled out.